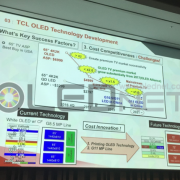 TCL announced “Establishing large-area OLED panel production plant”, is solution processed RGB OLED mass production accelerated? China TCL will invest RMB 42.8 billion (US$ 6.71 billion) in Shenzhen to establish a factory for large-area OLED panel production. According to South China Morning Post, TCL recently announced that it will produce 90,000 units on the basis of 70-inch panel in the new production line of Gen 11 (3370 mm x 2940 mm) with the goal of mass production in March 2021 in the data submitted to the Shenzhen Stock Exchange. The main products are to be known as 65-inch and 75-inch OLED panels, and 65-inch, 70-inch and 75-inch display panels with 8K resolution. TCL will form a partnership with the China Development Fund for the necessary financing and will set up a new production line at TCL’s semiconductor subsidiary with RMB 20.3 billion. 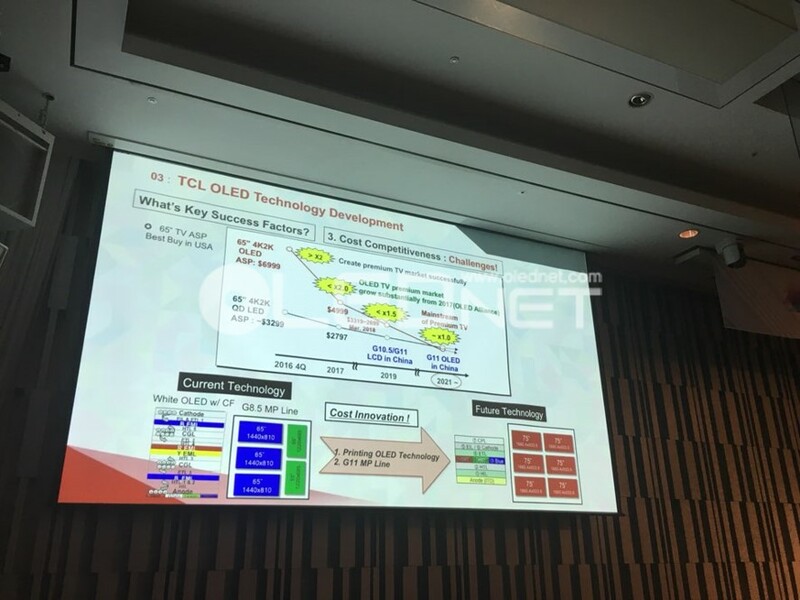 Large-area OLED to be produced by TCL is expected to adopt solution process RGB. At the ‘4th OLED Korea conference’ hosted by UBI Research in March, James Lee, deputy chief engineer of TCL mentioned about the development of next-generation premium TV with the screen size of 70-inch or more and 8K resolution, based on the solution process. Gen 11 production line is capable of producing six sheets of 75-inch OLED panels, being able to achieve a yield three times higher than Gen 8.5 production line and a cutting efficiency of over 95%. In addition, it is possible to produce large-area OLED panels with a real RGB structure instead of the WRGB structure when solution process is applied. 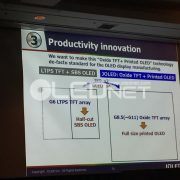 Based on this, TCL emphasized that the construction of the Gen 11 solution process OLED mass production line is essential. Meanwhile, TCL has jointly established JUHUA Printing Display Technology with Tianma, a Chinese company, in 2016 through CSOT, which is a subsidiary of TCL, and is continuously developing the inkjet printing process by a Gen 4.5 R&D pilot plant. http://olednet.com/wp-content/uploads/2018/05/180525.png 471 740 OLEDNET /wp-content/uploads/2015/09/logo_oled.png OLEDNET2018-05-24 11:30:162018-09-25 21:29:05TCL announced “Establishing large-area OLED panel production plant", is solution processed RGB OLED mass production accelerated? 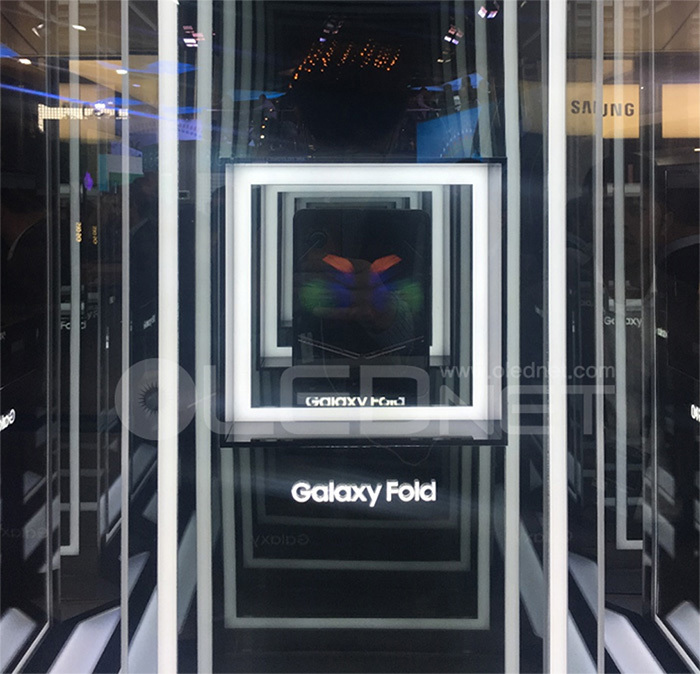 중국 TCL이 선전에 428억 위안(67억 1천만 달러)을 투자하여 대면적 OLED panel 생산을 위한 공장을 신설한다. 사우스차이닝모닝포스트에 의하면, TCL은 최근 선전 증권거래소에 제출한 자료에서 2021년 3월 양산을 목표로 Gen 11(3370 mm x 2940 mm) 신설 양산 라인에서 70 inch panel 기준으로 월 9만대를 생산한다고 밝혔다. 주력 제품은 65 inch와 75 inch OLED panel과 8K 해상도의 65 inch, 70 inch, 75 inch display panel 인 것으로 알려졌다. TCL은 자금 조달을 위해 중국 지원 개발 기금과 파트너쉽을 맺을 것이며, TCL 반도체 자회사에서 203억 위안을 들어 새로운 생산 라인을 설립 할 것으로 알려졌다. TCL이 생산 할 대면적 OLED는 solution process RGB 방식일 것으로 예상된다. 지난 3월 유비리서치가 주최한 ’4th OLED Korea conference’에서 TCL의 James Lee deputy chief engineer는 solution process를 기반으로 70 inch 이상의 대형 화면과 8K 해상도의 차세대 premium TV 개발을 언급한 바 있다. Lee deputy chief engineer는 “2020년 LG Display의 Gen 10.5 공장이 가동되어 대면적 OLED panel의 가격이 하락하게 되면 OLED TV와 premium LCD TV의 가격 차이는 1.4배 수준까지 줄어들 것으로 예상된다”며, “TCL은 현재 대면적 OLED용 solution process 기술을 개발 중으로 Gen11 공장에 적용이 가능할 것”이라고 밝혔다. 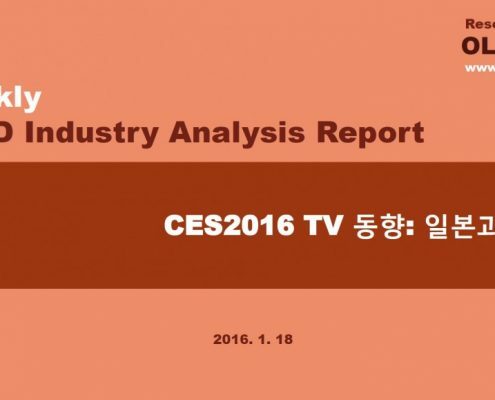 Gen 11 생산 라인에서는 75 inch OLED panel이 6장 생산 가능하며, Gen 8.5 생산 라인 대비 3배 증가한 생산량과 95% 이상의 면취율 달성이 가능하다. 또한, solution process 적용 시 WRGB 구조가 아닌 real RGB 구조의 대면적 OLED panel 생산이 가능하다. TCL은 이를 바탕으로 Gen 11 solution process OLED 양산라인 건설이 필수 요소라고 강조한 바 있다. 한편, TCL은 산하 업체인 CSOT를 통해 2016년 중국 기업 Tianma와 함께 JUHUA Printing Display Technology라는 합작사를 설립, 4.5세대 R&D 파일럿 공장을 만들어 잉크젯 프린팅 공정을 지속적으로 개발하고 있다. Inkjet might take advantageous position for Gen11 super large OLED mass production line! 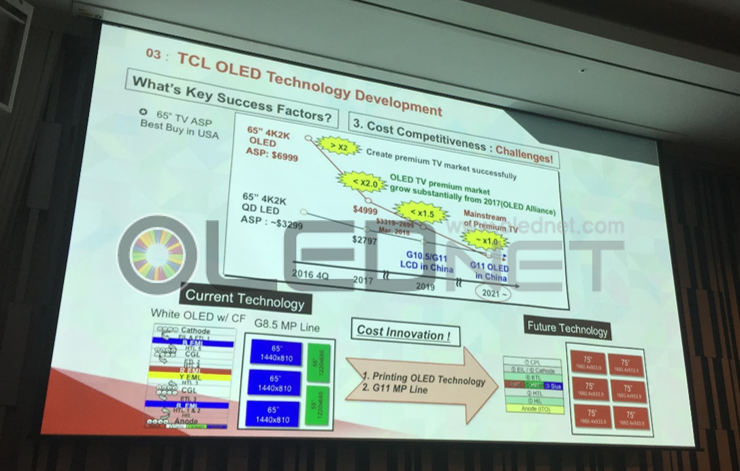 Toshiaki Arai, chief technologist of JOLED and James Lee, deputy chief engineer of TCL made presentations for the solution processed OLED on March 7 at the ‘4th OLED Korea conference’ held at Novotel Ambassador Hotel in Gangnam, Seoul, hosted by UBI Research. 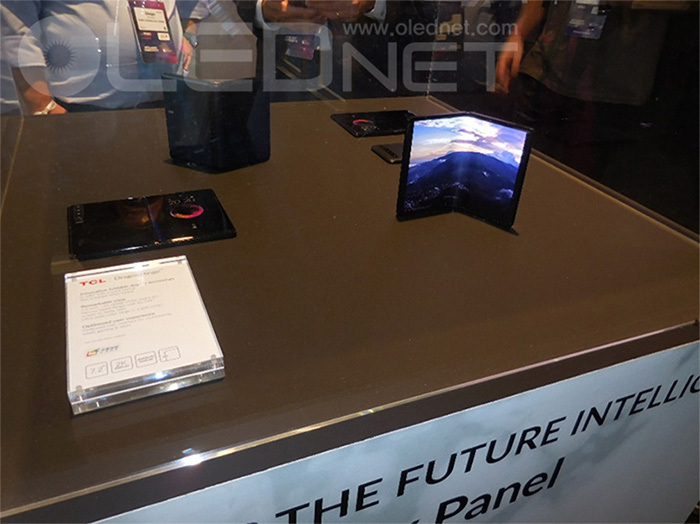 Toshiaki Arai, chief technologist of JOLED announced that JOLED will focus on the medium-size OLED market for 10 ~ 30 inch tablets with solution processed OLED. He explained “OLEDs for mobile devices are currently targeting over 500 ppi and at least 800 ppi, which is hard for today’s printing technology. However, current printing technology is competitive enough since the medium-size OLED for tablets is 300 ppi level”. 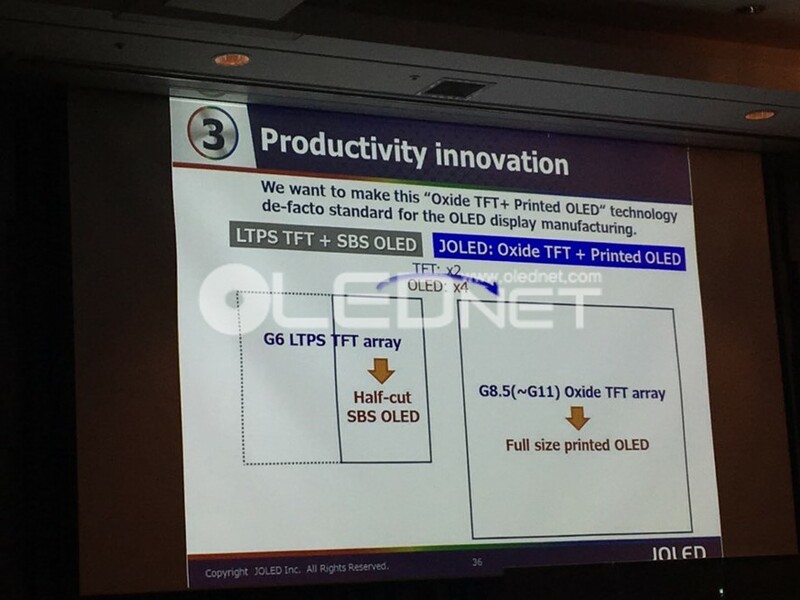 He also added, “While it is required to divide the mother glass with the deposition technology currently in use, JOLED’s oxide TFT and solution process OLED can be adopted to Gen 8.5 as well as Gen 11 without cutting the mother glass. Thus, we expect panel production to be increased significantly. http://olednet.com/wp-content/uploads/2018/03/180308_con1.jpg 665 886 OLEDNET /wp-content/uploads/2015/09/logo_oled.png OLEDNET2018-03-13 11:49:592018-09-25 22:13:17Inkjet might take advantageous position for Gen11 super large OLED mass production line! On 8 January 2018, the largest electronic show is held at Enclave Convention Center in Las Vegas, United States. Major electronic companies such as LG Electronics, Sony, Vestel, Changhong, Skyworth presented OLED TV as main exhibition. 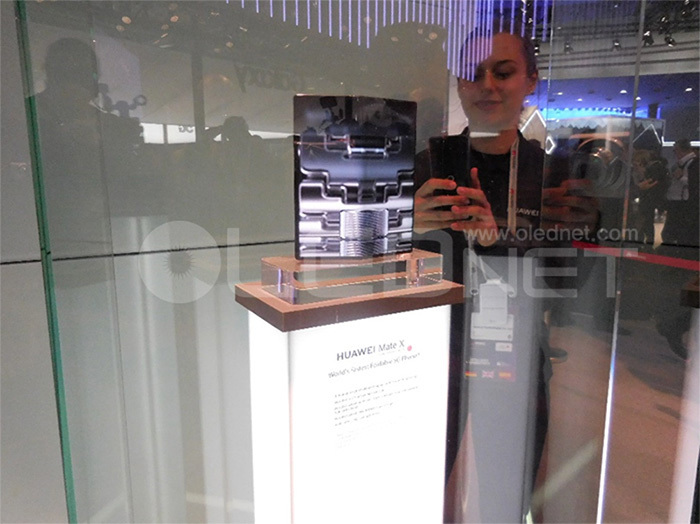 In particular, Samsung Electronics’ “Micro LED” exhibition received a great deal of attention. 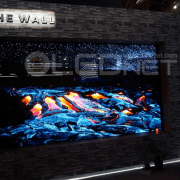 Samsung Electronics unveiled the world’s first “micro LED” technology-applied 146-inch modular TV, “The Wall.” People came to see the product and it was heated up in a hot issue. 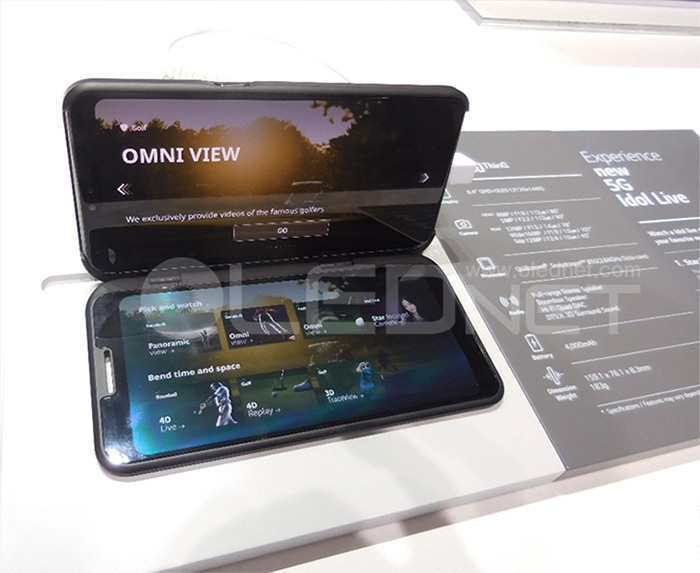 Samsung Electronics emphasized that this product is a future screen that is unlimited in image quality, size and form. 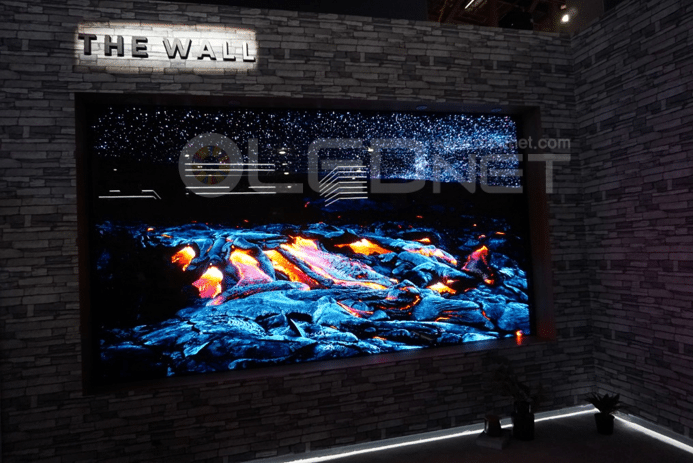 Through the implementation of the local dimming 3000, “The Wall”, which was unveiled at the exhibition show is developed by brightness, contrast ratio, color reproduction and black display compared to the existing display. Especially, the existing “Mini LED” products were exhibited along with “The Wall” for comparison of exhibition. And the excellence of “Micro LED” was outstanding. “Mini LED” products was little far from the large display as pixels and the lines of each module were shown on the screen. LG Electronics, Sony, Changhong and other companies presented 65-inch and 77-inch OLED TV display products including Sound Acoustic OLED TV products. In particular, Konka reflected the trend that TV is a part of furniture, not just electronic products and it consists of a set design that took advantages of Chinese traditional atmosphere. In addition, many set manufacturers have demonstrated the advantages of OLED TV, which is the lightest and thinnest through “Wall Paper TV” and “Slim” concepts. ‘TCL’, which occupies a side of QLED TV showed more advanced QLED TV in image quality and color reproduction range. 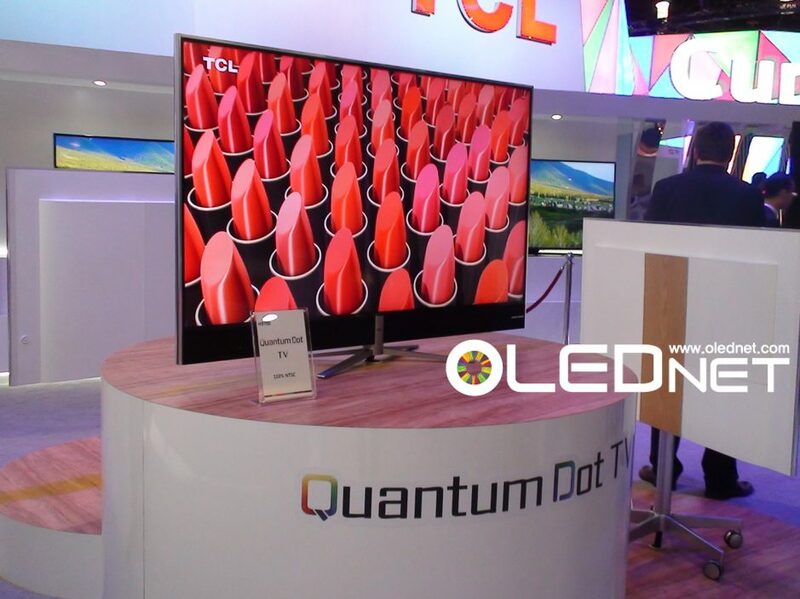 According to the person in charge of TCL, QD dominated the portion of the current market therefore, many manufacturers are producing Quantum dot LCD, and also considering OLED TV launches. The person in charge emphasized that they are building factories in China that produce only OLED. LG Electronics is a leading OLED TV company and showed OLED which is being developed continuously through making tunnels of OLED TV. 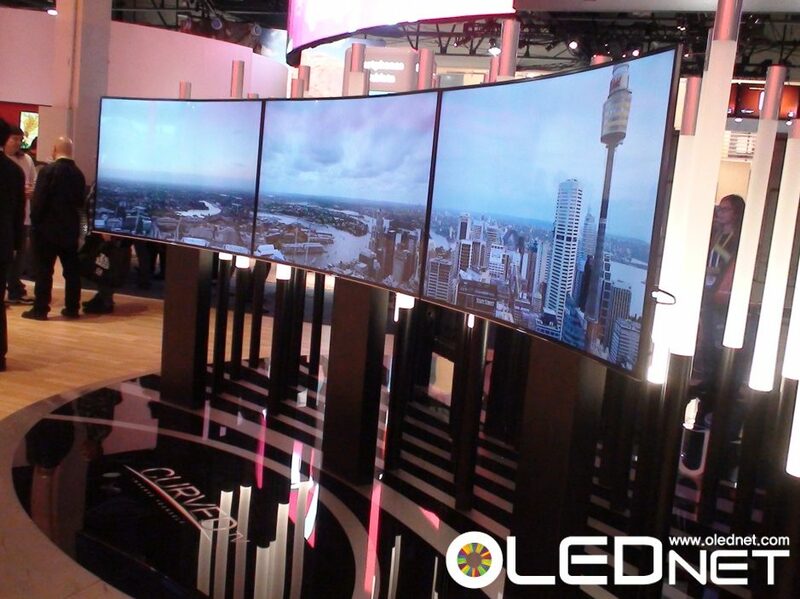 They revealed that LG Electronics is the world’s first OLED TV set manufacturer. People look forward to seeing OLED growth in the future through CES the first electronic exhibition show in 2018. TCL’s Xiaolin Yan CTO addressed solution process OLED TV and self-emitting QLED TV as premium TV after white OLED TV at iMiD 2017 keynote address in BEXCO, Busan on 29th. Yan CTO noted that white OLED TV, which is currently leading the premium TV market, meets all the requirements of premium TV due to its superior image quality, design differentiation, high resolution realization and nature-friendly characteristics compared to QD LCD TV. In addition, the price that is higher than the current QD LCD TV is expected to be overcome by applying the solution process, and mass production is also expected in 2019. Yan CTO predicted that the “solution process would be easy to produce 75-inch panels at Gen 10.5 because the process can be performed without splitting the ledger,” and “it is also possible to produce full-emission RGB OLED TVs.” However, he emphasized that the compatibility of materials and equipment and the development of ink forming process technology should be done. Lastly, He mentioned the establishment of printing technology in Guangdong JUHUA to promote the commercialization of solution process OLED TV and self-luminous QLED TV, and emphasized the cooperation of material, equipment and panel makers to develop next-generation premium TV. The potential of future OLED development is inexhaustible as OLED can be applicable to all industries including VR / AR, automotive, aerospace, and lighting not content with smart phone and TVs. There has been growing public interest in OLED in many different industries. To meet the market demand, Ubi Research, a market research company co-hosts ‘iMiD2017 Industrial Forum’ with Korea Display Society (KIDS) in BEXCO, Busan on 30th of August. The forum will proceed with a panel discussion among key specialists and presentation, which will enable people from many different industries to exchange information not only on the display market but also current OLED market status, technology and explore a new market potential generated in the future. In the first session ‘look for a new OLED market’, OLED replacement will be presented in view of OLED application development. The key players include Dr. Teruo Tohma, WooSeok Jeong, principal research fellow at the Electronics and Telecommunications Research Institute (ETRI), Julian K chang, Managing director of Boeing Corporation, Professor TAKUYA KOMODA at Yamagata University, senior researcher, Michi Hisaishi, ALPINE Michihisa Onishi. The second session, ‘Discussion of New Technologies in Future Display’ will provide insight into the latest products and technology trend of TV manufacturers competing with one another to dominate the next generation display market. Nam-Suk Oh, CEO of Samsung Electronics will present an updated LCD TV using Quantum dots technology under the title of “Quantum Dot and Advance of LCD-TV”. In the OLED TV camp, under the title of “OLED, Now and Future”, Joon-Young Yang at LG Display will review the current status of OLED TV led by the current market trends, and also address OLED future implemented in a wide range of ‘flexible and rollable’ designs. Weir Cao, senior researcher at TCL, will present both the technology status of the Colloidal Quantum Dots and TCL products applied to LCD in the market, under the topic of “TCL Display Technology with QDs”. The premium TV strategies are expectedly revealed. 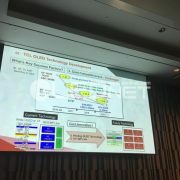 Lee Choong-hoon, CEO of Ubi research co-host of this forum, offered a time to summarize the premium TV market on the topic of ‘OLED TV market outlook by premium TV market expansion’ by analyzing the presentations of the companies that presented earlier. For more information on the 17th iMiD2017 Industrial Forum, please visit iMiD2017 official website (http://imid.or.kr/2017/indi_forum.asp). In MWC 2017, the competition over smart watches proceeded fiercely. The unveiling of Gear S3 by Samsung Electronics in the last IFA 2016 attracted great attention from the smart watch market. The disclosures of products that can compete with Samsung Electronics’ Gear S3 at MWC 2017 are gaining great popularity among viewers. 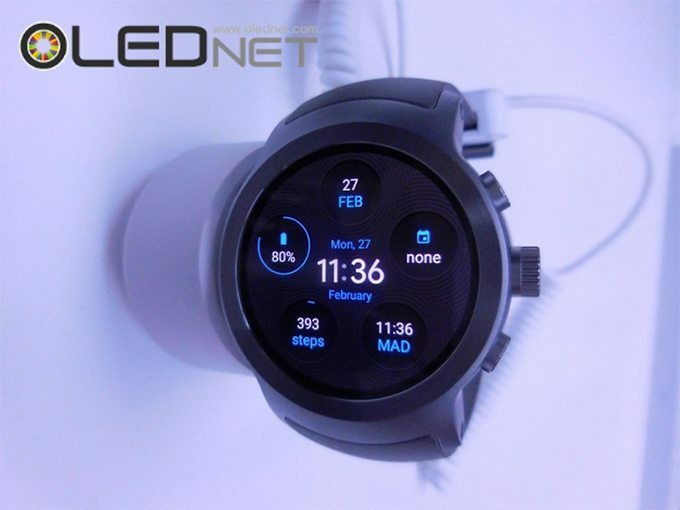 LG Electronics displayed G-Watch 2 Sports with 1.38-inch P-OLED and G-Watch Style with 1.2-inch P-OLED, HUAWEI exhibited HUAWEI Watch 2 and HUAWEI Watch 2 Classic with 1.2-inch AMOLED panel, and TCL showed MOVETIME with 1.39-inch AMOLED panel. 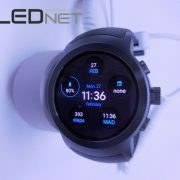 The smart watches shown by LG Electronics, HUAWEI, and TCL adopted flexible AMOLED (P-OLED) and circle types to save the designs of existing watches, and LG Electronics’ G-Watch 2 and HUAWEI’s HUAWEI Watch 2 can be used as devices independent of smartphones because they have separate sims. LG Electronics’ G-Watch 2 Sports is equipped with 1.38-inch circle type AMOLED panel, Google Android Wear 2.0, 768MB RAM, 4GB internal memory, and 430mAh battery, and it supports IP68-level waterproof and dustproof functions and wireless charging function. On the other hand, G-Watch 2 Style is equipped with 1.3-inch circle type AMOLED panel, Google Android Wear 2.0, 4GB internal memory, and 240mAh battery, and it supports IP67-level waterproof and dustproof functions. HUAWEI Watch 2 is equipped with a 1.2-inch circle type AMOLED panel, Qualcomm® Snapdragon ™ Wear 2100, 1.1GHz quad-core CPU, Google Android Wear 2.0, 4GB internal memory, 768MB RAM, and 420mAh battery, and it supports various types of Watch face, an equippable Sim (4G), and IP68-level waterproof and dustproof functions. 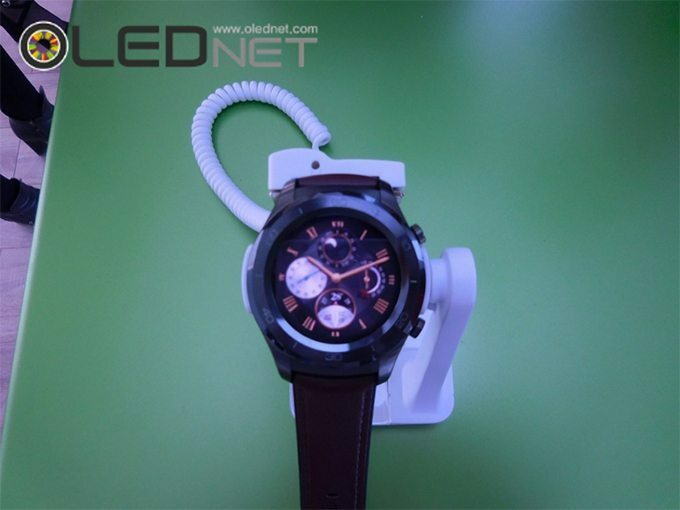 Meanwhile, LG Electronics and HUAWEI devoted considerable spaces to the smartwatch exhibition at their booths in the MWC 2017 exhibition, and it suggests that there will be big changes in the smart watch market which is dominated by Samsung and Apple. Following smart phone, other devices equipped with display such as tablet PC, monitor, and TV are mostly using OLED panel. In turn, LCD is attempting to replicate key points of OLED panel to catch up. The first is LTPS TFT technology. When Samsung Display started producing AMOLED using LTPS TFT, it was overlooked by the LCD sector as it financially needed twice the amount of investment compared to a-Si TFT technology and therefore thought it to have no business value. However, as the smart phone resolution is getting higher, LCD companies are also employing LTPS TFT that has high mobility. The second is the ultra slim thickness of OLED panel that does not have BLU. To answer the smart phone’s need for a thin body with light weight, LCD is thinning the panel by slimming the glass substrate further and further. Nowadays, even TV sector of LCD is busy trying to become thinner. 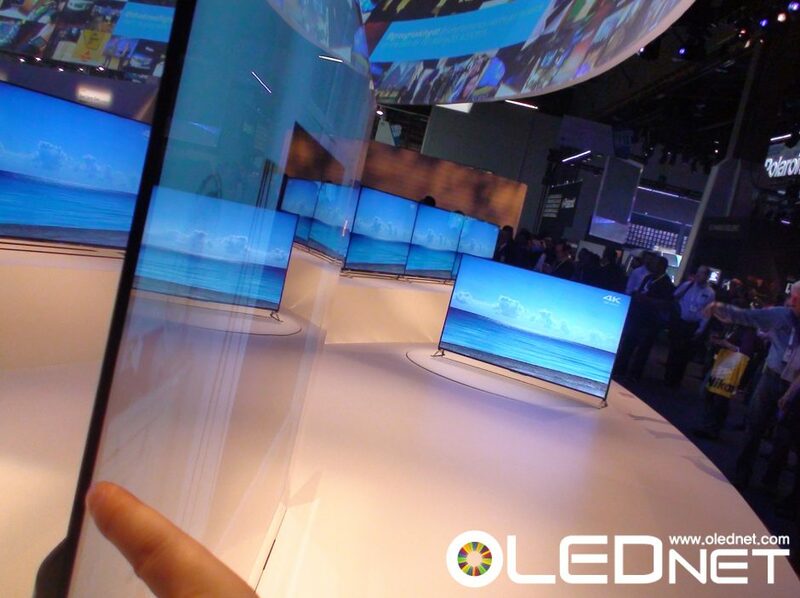 In CES2015, Sony exhibited ultra slim LCD TV with thickness of approximately 4.9mm. The third is curved design. LG Elec. and Samsung Elec. 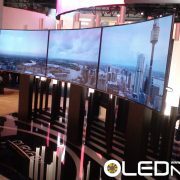 exhibited curved OLED TV using thinness of OLED panel in CES2013. With the products on the market, LCD TV also reduced thickness and began selling curved LCD TV. Hisense, a Chinese brand, exhibited LCD TV with curved design in CES2015. Samsung Elec. decided that the main product of 2015, SUHD LCD TV, will have curved design, as well as releasing a curved LCD monitor. However, despite reducing the thickness LCD cannot yet be applied to smart phones. The fourth is color reproductivity rate. The existing LCD TV can only produce approximately 80% of NTSC standard, which is limited compared to 110% of OLED. LCD sector criticized OLED’s color reproduction to be excessive; however, they recently developed new technology of applying quantum dot materials onto BLU and launched the sales of LCD TV with almost 120% of NTSC. Furthermore, it is deceiving the public by calling the QD BLU LCD TV as Quantum Dot TV packaged as a non-LCD TV. The fifth is contrast ratio. OLED TV’s contrast ratio is close to infinite with 1,000,000:1. Compared to this, LCD TV’s contrast ratio was 1,000:1, and unable to showcase dark scenes. Recently, HDR (high dynamic range) technology that brightens bright scenes and darkens dark scenes is strengthening its contrast ratio. 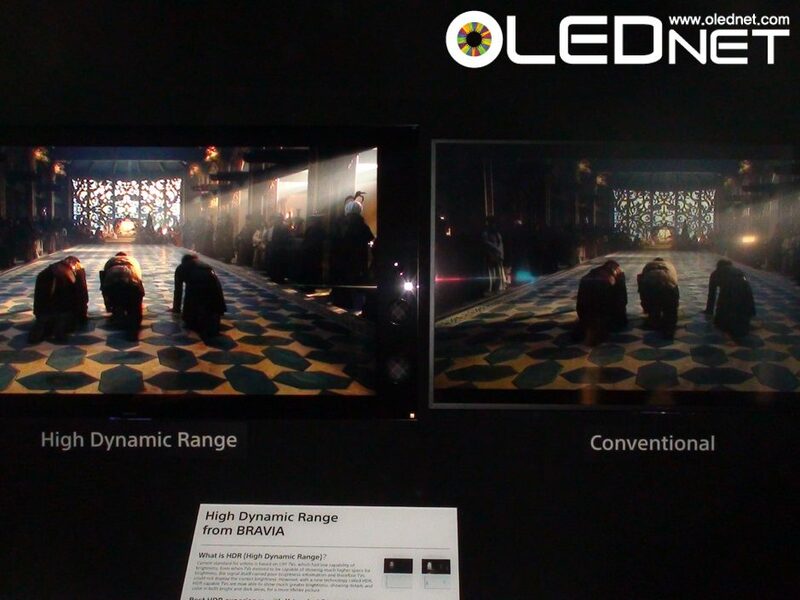 Sony is striving to achieve high contrast ratio for LCD TV, similar to OLED TV, and exhibited HDR technology applied BRAVIA in CES2015. 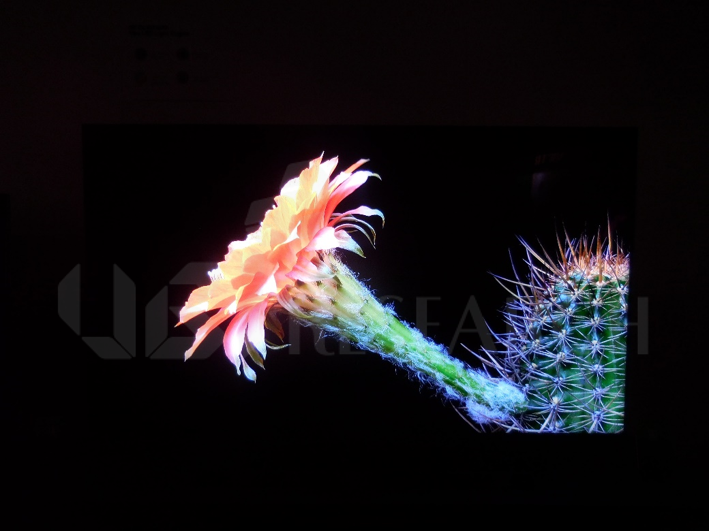 Many key points of OLED such as previously mentioned thickness, contrast ratio, and curvature ratio still need to be improved by LCD panel, and diverse attempts are continually being made to catch up to OLED panel that is entering the market with great strength. However, LCD cannot yet even attempt to match OLED on high speed response time that is needed for programs with fast action such as sports. OLED holds diversity in color definition and design, and even if LCD keeps on reaching for these characteristics, LCD will remain LCD and will not be able to overtake OLED. 스마트폰에 이어 태블릿 PC와 모니터, TV에 이르기까지 디스플레이가 적용되는 기기에 전반적으로 OLED 패널이 사용되자 LCD 역시 OLED 패널 특징을 따라가기 위한 다양한 시도가 이루어지고 있다. 첫째는 LTPS TFT 기술이다. 삼성디스플레이가 LTPS TFT로 AMOLED를 만들 초기에는 LCD 진영에서는 a-Si TFT에 비해 투자비가 약 2배 정도 소요되는 LTPS TFT 방식의 AMOLED는 사업성이 없다고 무시하였으나, 스마트폰의 해상도가 점차 높아지자 LCD 업체들 역시 이동도가 높은 LTPS TFT를 앞 다퉈 채용하고 있다. 두번째는 BLU가 없는 OLED 패널의 초슬림 두께이다. 경량 박형을 요구하는 스마트폰 특징에 부합하기 위해 LCD는 유리 기판을 깍고 또 깍아 패널을 얇게 만들고 있다. 이젠 TV에서도 LCD는 살 빼기에 여념이 없다. 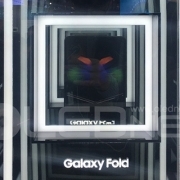 CES2015에서 소니는 두께가 약4.9mm인 초슬림 LCD TV를 전시하였다. 세번째는 curved 디자인이다. 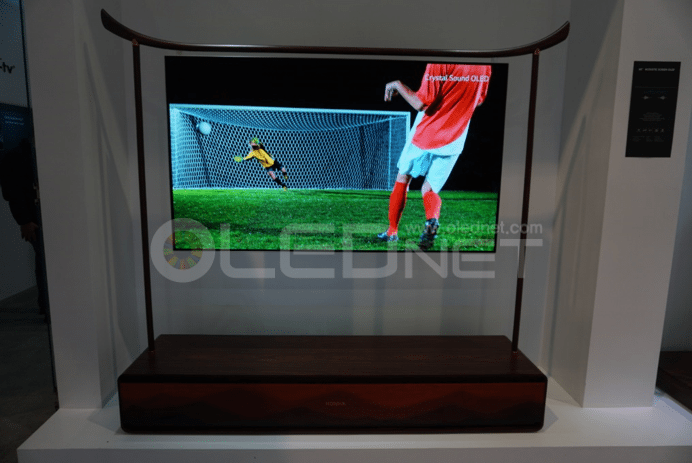 LG전자와 삼성전자가 OLED 패널의 얇은 두께를 이용하여 CES2013에서부터 curved OLED TV를 전시하며 제품을 판매하자, LCD TV 역시 두께를 줄이고 curved LCD TV 판매에 돌입했다. 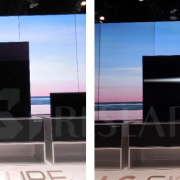 중국 TV 메이커인 Hisense는 CES2015에서 curved 디자인의 LCD TV를 전시하였으며, 삼성전자는 2015년 주력 제품으로 출시하는 SUHD LCD TV를 curved 디자인으로 결정하였으며, 더불어 모니터도 curved LCD 제품을 출시한다. 하지만 두께를 줄여도 스마트폰용 소형 디스플레이에서는 LCD가 아직 적용되지 못하고 있다. 네번째는 색재현율이다. 기존 LCD TV는 색재현율이 NTSC 기준 약80%애 불과하여 110% 정도의 색을 재현 할 수 있는 OLED에 비하면 표현이 한정적이었다. LCD 진영은 OLED가 표현하는 색상은 너무 과도하다고 폄하하였지만, 최근에는 quantum dot 재료를 BLU에 부착하여 개발한 새로운 기술로서 120%에 가까운 초과도 색재현율을 나타내는 LCD TV 판매에 돌입했다. 더욱이 QD BLU LCD TV의 이름을 Quantum dot TV라고 명칭하며 LCD TV가 아닌 것처럼 포장까지 하고 있다. 다섯번째는 명암비이다. OLED TV는 명암비가 1,000,000:1 이상으로서 무한대에 가깝다. 이에 비해LCD TV는 명암비가 1000:1에 불과하여 어두운 장면은 표현이 불가능하였다. 최근에는 밝은 화면은 더 밝게 하고 어두운 화면은 약간 더 어둡게 표현할 수 있는 HDR(high dynamic range) 기술로서 명암비를 강화하고 있다. 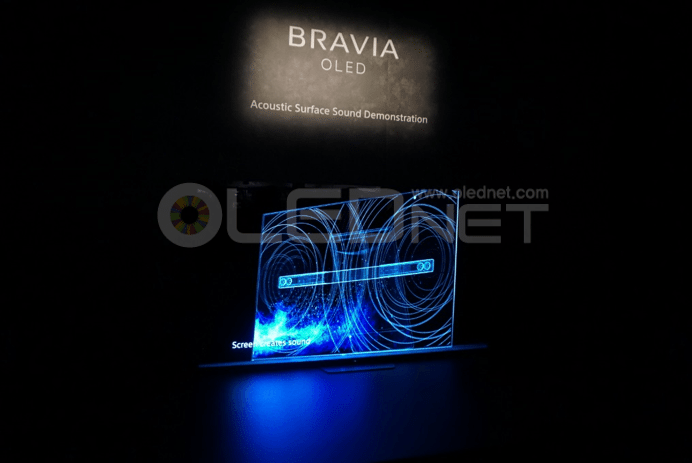 소니는 CES2015에서 HDR 기술을 적용한 BRAVIA를 전시하여, LCD TV로서 OLED TV 처럼 명암비를 표현하고자 노력하고 있다. 앞에 기술한 두께와 명암비, curved 디자인의 곡률 반경 등이 OLED에 비해서는 LCD 패널이 개선해야 할 점이 아직 많지만, 새로운 강자로서 시장에 진입하고 있는 OLED 패널을 따라 가기 위한 다양한 시도가 계속 이어지고 있다. 하지만 LCD TV는 스피드가 있는 스포츠 등의 화면을 보기 위해 필요한 고속 응답 속도는 OLED를 따라가기 위한 시도 조차 못하고 있다. OLED는 화질과 디자인 등에서 다양성을 보유하고 있어, LCD가 추격해와도 OLED는 OLED이고 LCD는 LCD일 뿐인 점은 변화가 없을 것이다.